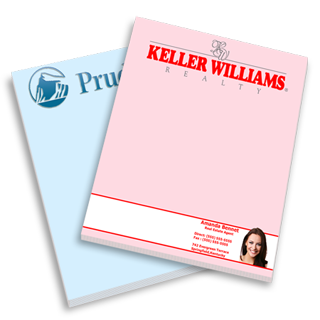 Custom notepads can be a great way to keep your business right in front of people. Notepads are a very useful tool around any office. To help you put some thought into the design of your notepad we placed a few tips below. Have your contact information on the bottom of the notepad. The key is to have a useful note and not have it cluttered with your information so keep it small. Use eye catching colors since your fonts will be smaller. We can design and send you a proof for your notepad design. Our in-house design team can create a great looking note pad that is useful and still brands your business. Our notepads are printed on quality materials that allow us to provide cheap and effective branding through custom notepads. We also have shipping options which gives you greater flexibility to order the notepads from anywhere.